The last Supper (Bartsch 27, Hirschmann 21, Strauss 356 i/ii). Original engraving, 1598. A very good impression on laid paper of the first state of two. 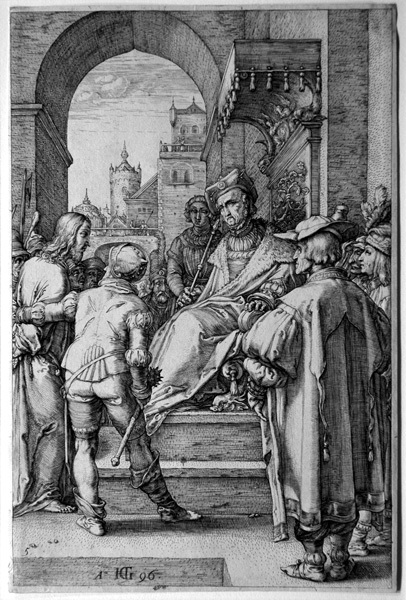 Although this is the last print executed for the series, it is the first in the narrative of the Passion and carries the dedication to Cardinal Federigo Borromeo, Archbishop of Milan, top center. Signed and dated in the plate, numbered bottom left margin. Ex collection John S. Philips, The Pennsylvania Academy of Fine Arts (with their PAFA stamp verso), and the Philadelphia Museum of Art, who received it as part of their purchase of the PAFA collection and offered it for sale as surplus. Trimmed on or within platemark. Image size: 196x130mm. Price: $5500. The print is rectangular; as I was photographing it, the bottom lifted up off the mat, so the photograph reduces a 3-dimensional image to 2 by distorting the bottom right of the photograph. 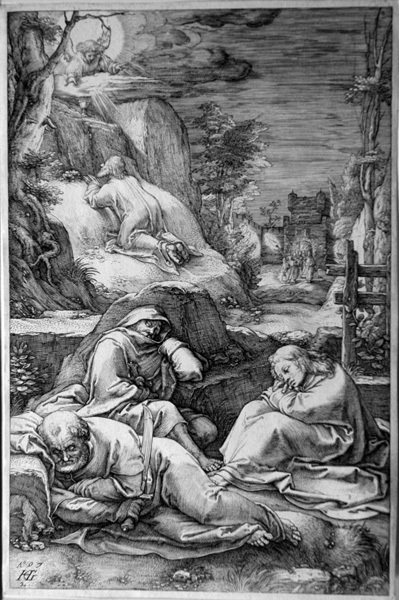 The Agony in the Garden (Bartsch 28, Hirschmann 22, Strauss 342 i/ii). Original engraving, 1597. A beautiful impression on laid paper of the first state of two. Signed and dated in the plate, numbered bottom left margin. Watermark: Coat of arms with bear (close to Briquet 1058Bern, 1589). Thread margins on all sides. 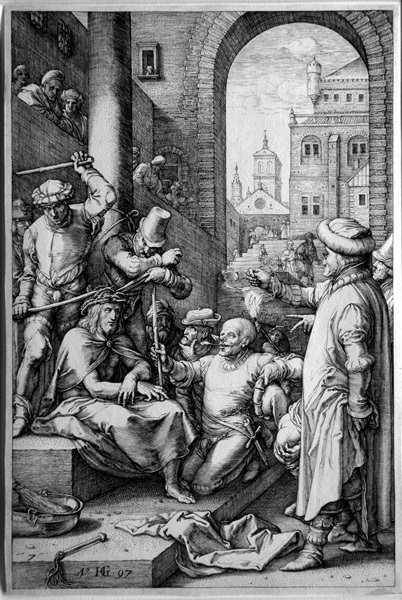 Like the other engravings in the Passion, this print shows Goltzius' use of and changes from Durer and Lucas van Leyden. Image size: 202x134mm. Price: $6000. The Betrayal of Christ (Bartsch 29, Hirschmann 23, Strauss 355 i/ii). Original engraving, 1598. A beautiful impression on laid paper of the first state of two. Signed, dated, and numbered 3 in the plate. Watermark: Escutcheon with diagonal stripes and letters WR appended, surmounted by a fleur-de-lis (Briquet 995, 1589). Ex collection John S. Philips, The Pennsylvania Academy of Fine Arts (with their P.A.F.A. stamp verso), and the Philadelphia Museum of Art, who received it as part of their purchase of the PAFA collection and offered it for sale as surplus. Thread margins on all sides. Strauss syas that "Goltzius has arrived at a compositional solution quite different from those of Albrecht Dürer and Lucas van Leyden. No longer is the scene crowded. . . . Peter and Malchas, the servant of the High Priest, still dominate the foreground, but the viewers's eye is drawn to the scene of the Judas kiss, emphasized by the bright lantern held aloft from a pole." Image size: 202x134mm. Price: $6000. 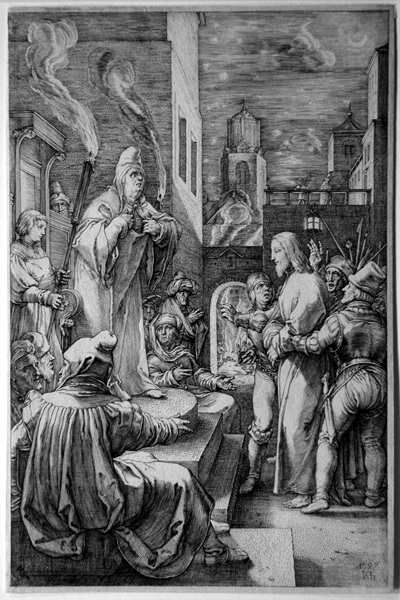 Christ before Caiaphas (Bartsch 30, Hirschmann 24, Strauss 343 i/ii). Original engraving, 1597. A beautiful impression on laid paper of the first state of two. Signed, dated, and numbered 4 in the plate. Watermark: Coat of Arms with horizontal band, castle, and bear. Strauss observes that this work is enngraved "in the manner of Lucas van Leyden." 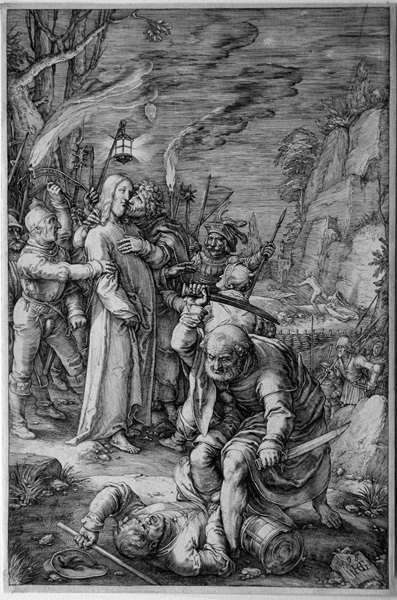 Durer also dealt with this subject in both his Small Woodcut and engraved Passions. Ex collection John S. Philips, The Pennsylvania Academy of Fine Arts (with their P.A.F.A. stamp verso), and the Philadelphia Museum of Art, who received it as part of their purchase of the PAFA collection and offered it for sale as surplus. Thread margins on all sides. Image size: 201x133mm. Price: $6000. Christ before Pilate (Bartsch 31, Hirschmann 25, Strauss 332 i/ii). Original engraving, 1596. A beautiful impression on laid paper of the first state of two. Signed, dated, and numbered 5 in the plate. Strauss thinks this is the first of the 12 sheets Goltzius engraved, all in the manner of Lucas van Leyden. All of Goltzius' drawings exist. Ex collection John S. Philips, The Pennsylvania Academy of Fine Arts (with their P.A.F.A. stamp verso), and the Philadelphia Museum of Art, who received it as part of their purchase of the PAFA collection and offered it for sale as surplus. Thread margins on all sides. Image size: 197x130mm. Price: $6000. Christ Crowned with Thorns (Bartsch 33, Hirschmann 27, Strauss 340 i/ii). Original engraving, 1597. A beautiful impression on laid paper of the first state of two. Signed, dated, and numbered 7 in the plate. 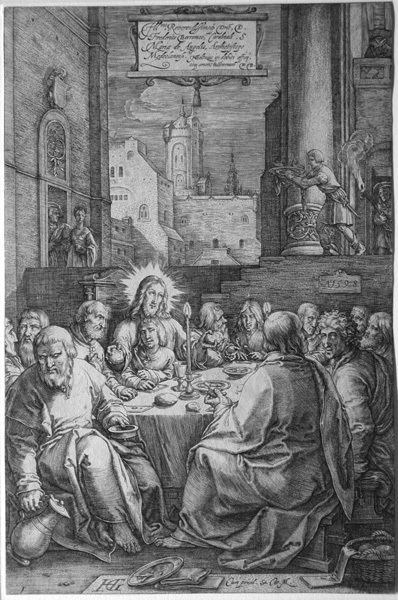 Strauss observes that the composition is based upon Durer's in the Small Woodcut Passion. All of Goltzius' drawings exist. Thread margins on all sides. Image size: 197x130mm. Price: $5500.